The stacked-cubes necklace at Anthopologie. WEATHERED: This stacked-cubes necklace has everything we love right now: the subtle, not-too-blingy sheen of the brass, the imperfect, vaguely d.i.y. 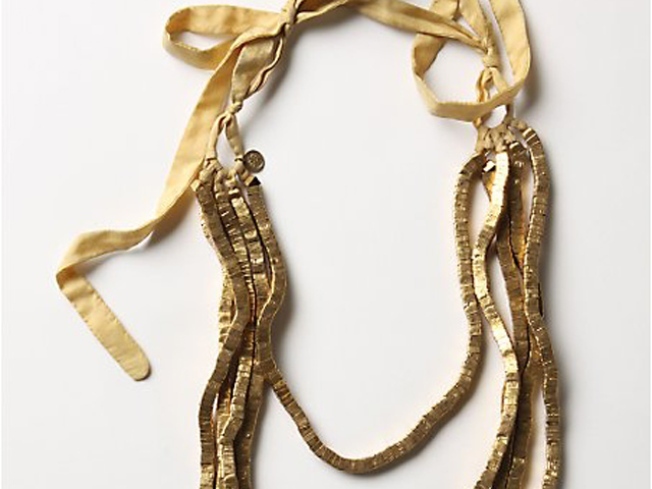 feel of the multi-length strands, and the trousseau-ish hand-finished ribbon. L-o-v-e. Anthropologie, $118; find your closest store. SHOP FOR A CAUSE: Allure Fashion Director Michael Carl has hand-picked all the offerings you’ll be fighting over at tonight’s Last Days of Summer fundraising sale at Housing Works’ splashy new Tribeca digs. We’re told to expect white jeans by Marc Jacobs and swimwear galore – plus the sparkling company of co-hosts/designers Charlotte Ronson and Shoshanna Gruss. 6-9PM. Housing Works Tribeca Thrift Shop, 119 Chambers Street; 212-732-0584. CUTS LIKE A…: We’re of the opinion that you can do most things in the kitchen with a few good knives. The Wusthof CIassic Offset All-Purpose model is not only the only bread knife you’ll ever need to buy; it’s also a rockstar on roasts and will even carve poultry in a pinch. It’s on sale right now at Broadway Panhandler for $49.98 (down from a list price of $120). 65 East 8th Street; 866-266-5927.